Mes cuml dia sed ineniasinge dolor ipsum commete ipsum comnetus Ipsum ineniasinge dolor. Dolor ipsum commete psum comnetu. Dolore ineniasinge dolor. Equip your kitchen with this knife. Great for working with vegetables, poultry and fish as well as dicing and chopping, it's easy to manoeuvre and minimizes friction when cutting so you can easily glide through the cut. Its offers great edge retention. Slicing and dicing the ingredients for your favorite recipes requires quality knives. 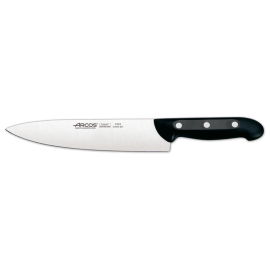 A chef's knife, or cook's knife, is a general-purpose cutting tool with a broad, tapered shape and a fine edge perfect for chopping vegetables and other foods. Buy a chef's knife individually or as part of a cutlery set with a knife block for storage. It's also wise to buy a knife sharpener to keep your investment in top shape. We offer an extensive range of premium kitchenware, cookware, appliances, homeware, outdoor products and more bringing you the best world-class brands including KitchenAid, Vitamix, Blendtec, Bugatti, Scanpan, Cuisinart, Led Lenser, Simple Human, Global Knives, Magimix, Bamix, Jamie Oliver Cookware, Stanley Rogers, Leatherman, Oxo, Le Chasseur, Avanti, Swiss Diamond, Wusthof, Shun, Tojiro, and many more leading brands. With both online and in store shopping, we strive to provide the best possible service, equipping our customers with comprehensive product and purchasing information so you can make informed decisions. Equip your kitchen with this knife. Great for working with vegetables, poultry and fish as..